"5/5! 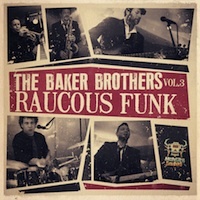 You want something vintage and soulful with plenty of character? Check this collection out for sure." 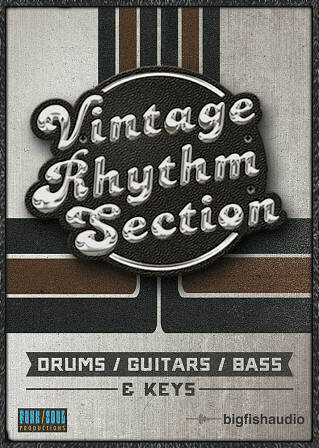 Vintage Rhythm Section is a virtual instrument for Kontakt 5 designed to emulate the classic rhythm section sounds of R&B, Soul, Funk, Jazz, and Rock records from the 1960's and 1970's. 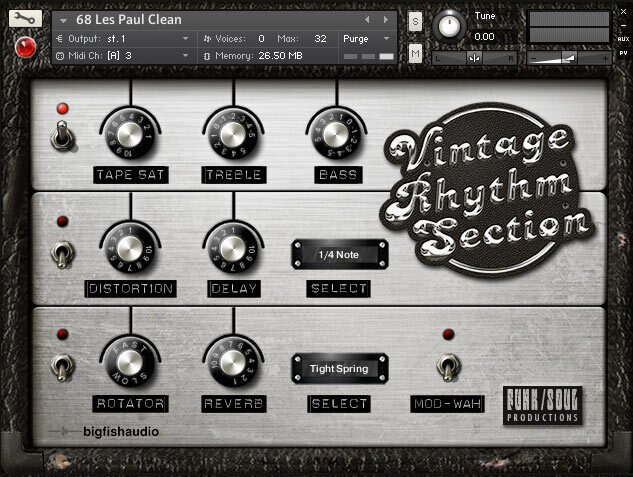 Vintage Rhythm Section (VRS) is easy to use, with a simple interface that lets you work quickly and intuitively. If you're producing retro or indie-style music on a budget, or if you're a TV or film composer working on a tight deadline, VRS can be used to create live-sounding drums, bass, guitar, keyboard, and percussion tracks. 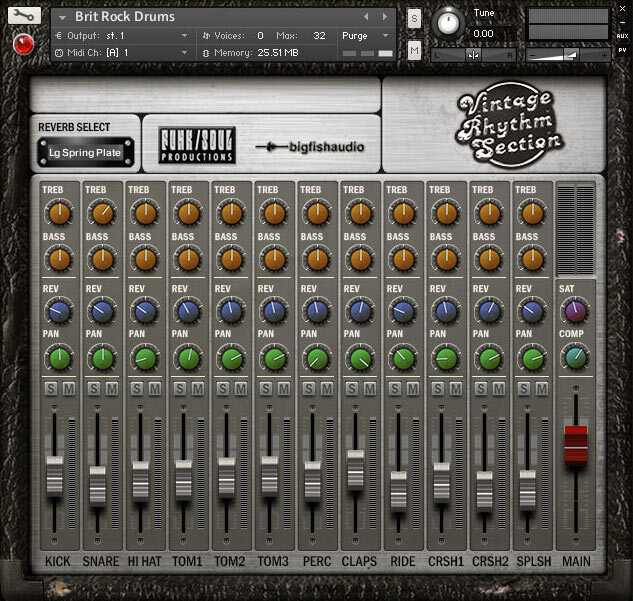 Like its sister-products, Vintage Horns and Vintage Strings, Vintage Rhythm Section was not designed to be a shiny, perfect-sounding virtual instrument. Instead, we tried to capture the way rhythm sections sounded back in the 60's and 70's, including some of the minor imperfections that added character to those instruments and made them sound so good. For VRS, we sampled a large collection of vintage instruments - some amazingly still in mint condition, and others looking every bit as "vintage" as you'd expect a piece of 40-50 year-old gear to look. Wherever possible, we used the same types of amps and mics that were used in the 60's and 70's. Some of this old gear was pretty funky-sounding, which probably would have disqualified it from being used on most other types of sample libraries. But for VRS, it was just what we were looking for. 2) The main GUI, which is used for all of the keyboards, basses, and guitars. Here's a quick overview of both. - Reverb Select: This is a drop-down menu that allows you to select various types of convolution IRs. - Channel Strips: Each offers controls for Treble, Bass, Reverb Amount, Pan, and Solo/Mute. Note that not all kits have the same number of toms and cymbals. Instead, each kit was custom-built to fit the musical genre and era it came from. - Master Channel: Allows you to add tape saturation (SAT) and/or compression (COMP) to the entire kit. Key-switching is a function that allows the user to quickly change from one articulation to another. If an instrument has any key-switch options, it will have red keys located on the far left of the Kontakt virtual keyboard. Many of the basses and guitars offer key-switched long and short (sustain and staccato) articulations, and some of the keyboards offer different key-switched presets. The Following End User License Agreement is included with Vintage Rhythm Section. 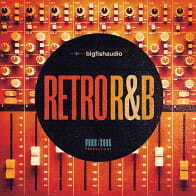 This License is only valid for the individual who has purchased an unopened, new and lawfully made copy of Vintage Rhythm Section from a dealer or distributor authorized by Big Fish Audio. "The Following End User License Agreement is included with Vintage Rhythm Section. 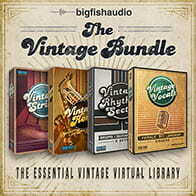 This License is only valid for the individual who has purchased an unopened, new and lawfully made copy of Vintage Rhythm Section from a dealer or distributor authorized by Big Fish Audio. "End User License Agreement: The samples contained herein are licensed, not sold to you, the individual end user, by Big Fish Audio. This non-exclusive, non-transferable license is granted only to the individual end user who has purchased an unopened, new and lawfully made copy of this product from a dealer or distributor authorized by Big Fish Audio. All samples remain the property of Big Fish Audio and are licensed only for use in the creation of a live or recorded performance that includes the licensed samples as part of a derivative musical work created by the licensed end user. This license expressly forbids resale, rental, loan, gift or transfer of these samples in any format or via any medium, except as part of a derivative musical work. The samples may not be included, whether unmodified or as part of a derivative work, in any sample library product. Any unlicensed usage will be prosecuted to the maximum extent possible under the law.""